Heather and Matthew Nover, along with 11-month-old Jane Sarah, visited his family to celebrate his new position. He will add director of Hebrew High School at Congregation Neve Shalom in New Jersey to his current position as principal of religious school at Temple HaTikvah, also in New Jersey. Matthew Nover, grandson of Earl and Shirley Givant, visited his family in Fort Worth with his wife Heather and 11-month-old daughter Jane Sarah. Matthew has recently been appointed director of the Hebrew High School at Congregation Neve Shalom in Metuchen, New Jersey. He is also the principal of the religious school at Temple HaTikvah in Flanders, New Jersey. Additionally, he will serve as the rabbinic intern at Rutgers University Hillel while attending his second-to-last year of rabbinical school at the Jewish Theological Seminary in New York this year. 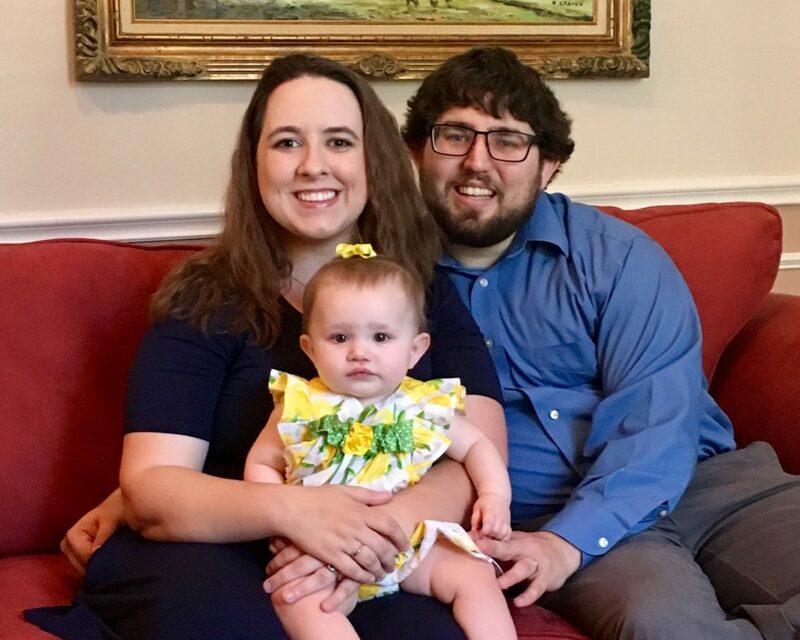 Matt has already completed two master’s degrees from JTS, one in Bible and one in Jewish education. Matt has always had a love for Judaism which started with his family and continued through his attending Lil Goldman Preschool and Fort Worth Academy, his bar mitzvah at Ahavath Shalom in Fort Worth, attending Fort Worth Country Day School and living in Israel for a year with USY’s Nativ program. He moved on to Rutgers University, where he graduated with dual majors in both Jewish studies and physics. Matthew’s family is incredibly proud of him for his many accomplishments. The Dolores Schneider JWVA Memorial Post 755, along with members of Congregation Beth Shalom and their families, prepared and served lunch to the residents at the Ronald McDonald House in Fort Worth, Sunday, June 16. Families from other towns (or states or countries) that have a child who is a patient at Cook Children’s Hospital can stay at Ronald McDonald House for minimal cost. Post members Jayne Michel, Dr. Julian and Marian Haber, Ted and Rita Hoffman, Joyce Atkens, Cookie and Phil Kabakoff, and Elaine Bumpus, were accompanied by Mark and Danielle Snailer, Debbie Goldsmith, Stephanie and Hailie Posner, Lauren Atkens, Alyssa, Brent and Shelbie Dingman and Lisa Rein. Grilled hot dogs, hamburgers, potato salad, chips, salad, and ice cream sundaes and beverages were enjoyed by about 100 residents. A special thank-you goes out to grill chefs extraordinaire Dr. Julian Haber, Ted Hoffman and Phil Kabakoff. It was a memorable and rewarding experience to see the smiling faces of the patients’ and their families. JWVA looks forward to doing this again in the future.